Food Combinations that You Should Never Ever Try! Food combining is a health-conscious approach to eating, where foods that require different digestive environments are eaten combined. Various food combination concepts have somewhat controversial views, however, there are some points that they agree on. Not all food combinations are good for us. Some food combinations may pose risk to our health. Milk and tea are not necessarily a healthy combination. Both beverages are good sources of nutrients and antioxidants, but studies show that mixing them result in a number of negative effects. Tea has anti-diabetic properties and improves cardiovascular health. But when milk is added, its anti-diabetic properties and antioxidant potential are reduced. What makes this combination bad for us? Simple carbohydrates increase blood sugar the most. If we combine white bread and jam, it creates destruction to blood sugar levels, says Liz Weinandy, a dietitian at Ohio State University Wexner Medical Center. 3. Salad and fat free dressing When people stay away from fat on their salad, they put a barrier to the absorption of its nutrients. If you want to maximize the nutrients in your salad, choose the regular salad dressing. Many people drink coffee after consuming alcohol to perk up. But a research shows that people who mix alcohol and caffeine have a greater chance of being involved in accidents. Getting drunk with alcohol is a bad idea, but drinking caffeine afterwards is much worse. This is very famous combination especially when going out with friends. Burgers and beer together is not only bad for health, it can also make you feel bad. 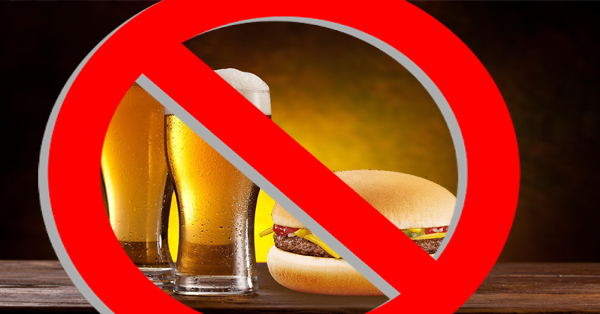 Fats from burger and alcohol are processed in the liver; our body breaks down the alcohol first because it distinguishes alcohol as toxin. This would leave fat floating in our bloodstream where it can be stored in our fat tissues.